I recently made a visit to Shields Date Gardens. They have about 10 different types of dates to choose from. And if you are anywhere in the Palm Springs area, you have to have drop by for a date shake! 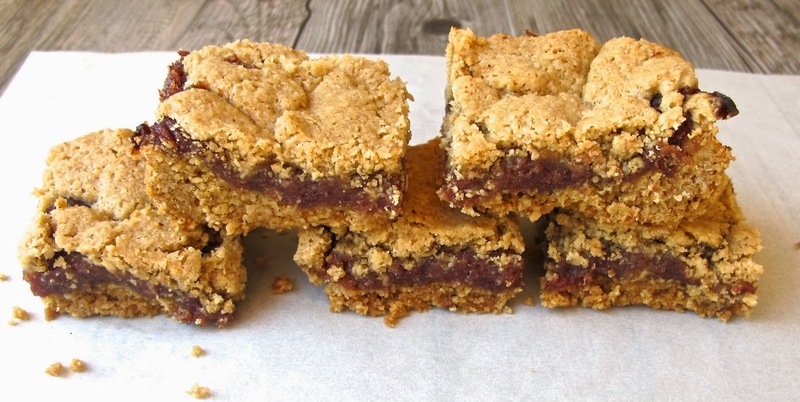 I purchased a couple of the most popular dates and got to thinking that we have not had date squares in a long time, and Bake loves them. In a medium saucepan over low heat, mix dates and water, stir and cook about 5-10 minutes. Date will be soft and most of the water absorbed. Remove from heat and add vanilla. Set aside to cool. Butter a 9 inch baking pan and line the bottom with parchment paper. Place the oats, flour, sugar, baking soda, salt, cinnamon in a food processor and pulse to mix. Add butter to the flour mixture and process until mixture comes together. Put 2/3 of oatmeal mixture and press into the bottom of the pan. Spread date puree over the top of base. Then crumble the rest of oatmeal mixture over the dates, gently press and compact the crust. Chill well and then cut into squares. Date squares will keep a week in the fridge. This creamy, rich, green smoothie is perfect for the winter months. The avocado provides good fat, spinach greens, and the dates, a little sweetness. This is one for the vegans! 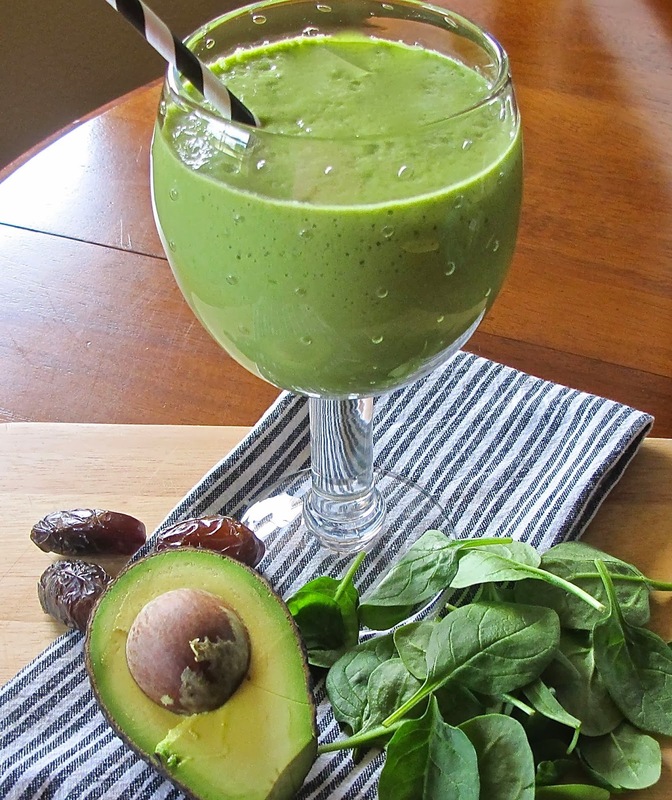 Blend the milk, banana, spinach, avocado, and dates well, in a strong blender, such as a Vitamix. While walking through the airport in Portland, a magazine cover that proclaimed The Bacon Issue, caught my eye. I opened it to the appetizer section and this is the first snack I noticed. On a party tray with meats and cheeses, next to a bowl of tomato soup, or just by itself, a great snack. In a food processor, combine bacon, cheese, flour, butter and pepper and pulse until clumps form. Shape into a 12 inch log on wax paper, wrap and chill. Slice 1/3 inch thick and place on a silpat or parchment lined baking sheet. Truffles are the classic Valentines Day gift. What better way to celebrate, with chocolate and Champagne? They can be made a day ahead of time, put in pretty papers, and then box them up. Choice of coating, toasted nuts, powdered sugar, melted chocolate, etc. Place the cream in the top of a double boiler and bring water to a boil. Chop the chocolate into 1/2 inch pieces. Turn off the heat and add chocolate to the cream. Stir until chocolate is melted. Stir in liquor. Pour chocolate mixture into a shallow bowl and chill until the chocolate is firm. Using a melon scoop, form small balls and put on baking sheet lined with parchment paper. If they begin to soften, chill again to firm them up. Place each of the coating ingredients into separate shallow dishes. 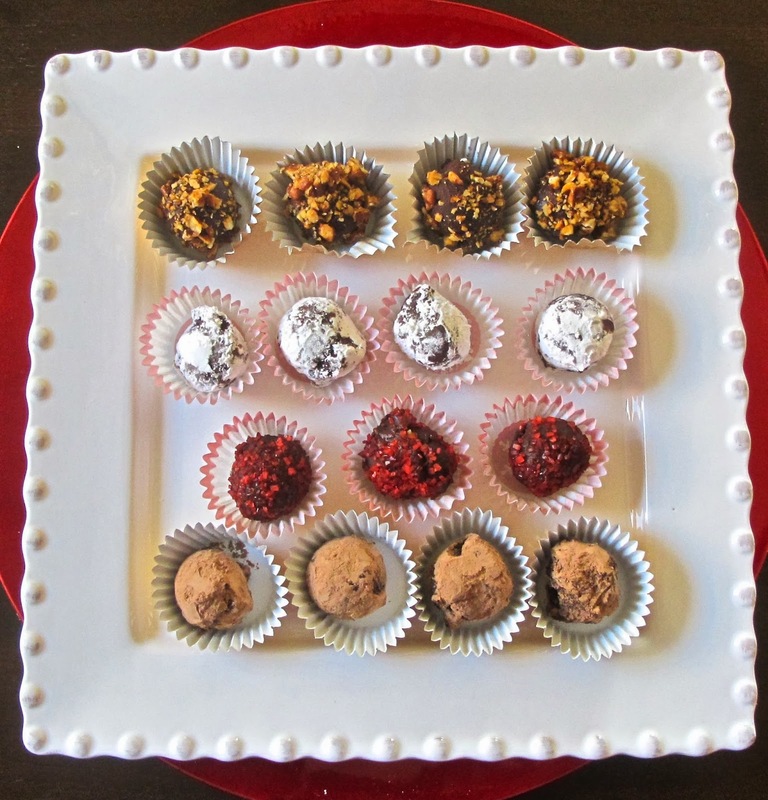 Roll the chocolate truffle into desired coating and keep refrigerated. The truffles can be kept for a couple of weeks refrigerated. Store in airtight container between sheets of wax paper. 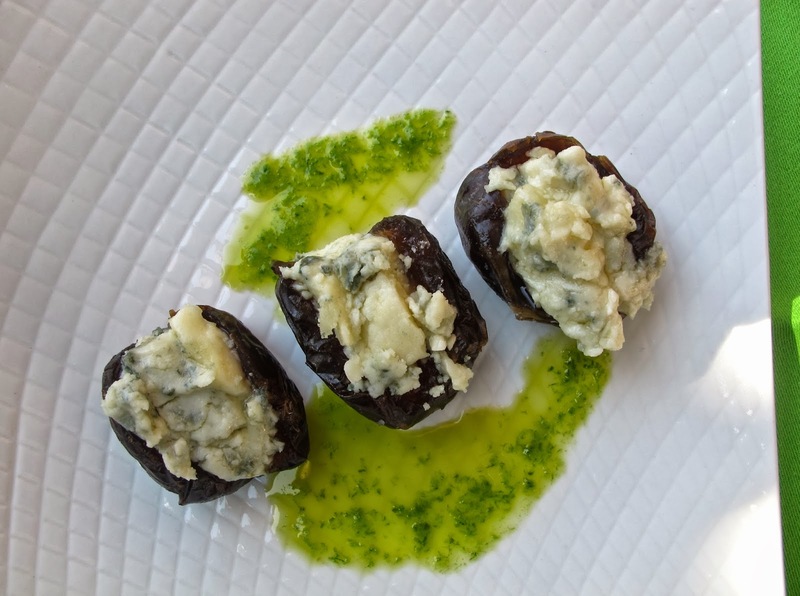 These crispy little cakes are so versatile, different greens can be substituted for the peppers, a marinara sauce in place of the Tzatziki sauce, and the cheeses can be changed for different flavors. In a large bowl, combine quinoa, and eggs. Stir in shallots, chives, bell pepper, garlic, salt, pepper, and cheese. Add bread crumbs to combine. Using a 1/3 measuring cup, fill with quinoa mixture to form a patty, about an inch deep. In a large, non stick skillet, over medium heat, add 1 Tablespoon olive oil. 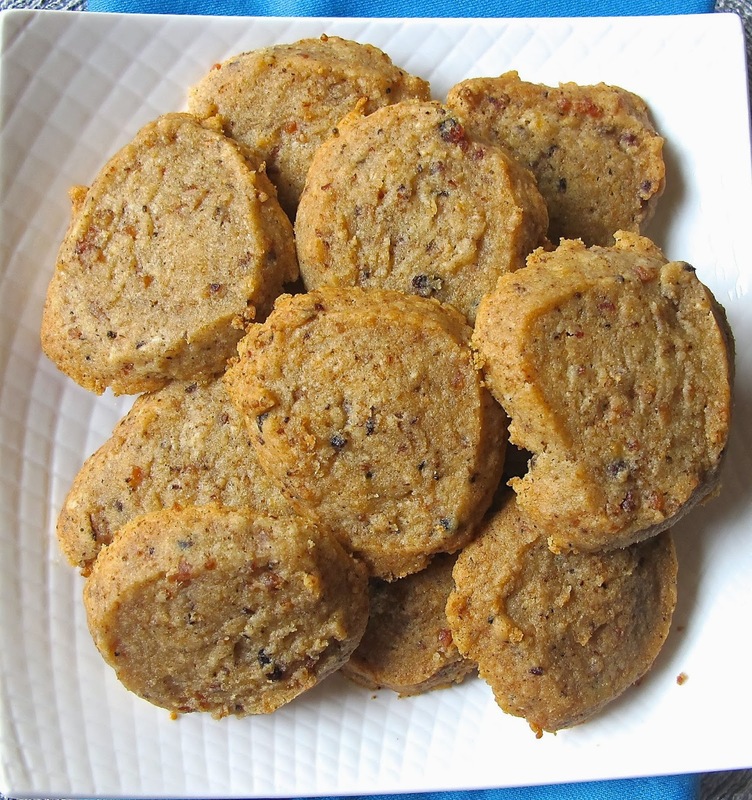 Place the quinoa cakes in the skillet and bake about 7-10 minutes a side, until brown and crispy. Repeat until all the cakes are cooked. 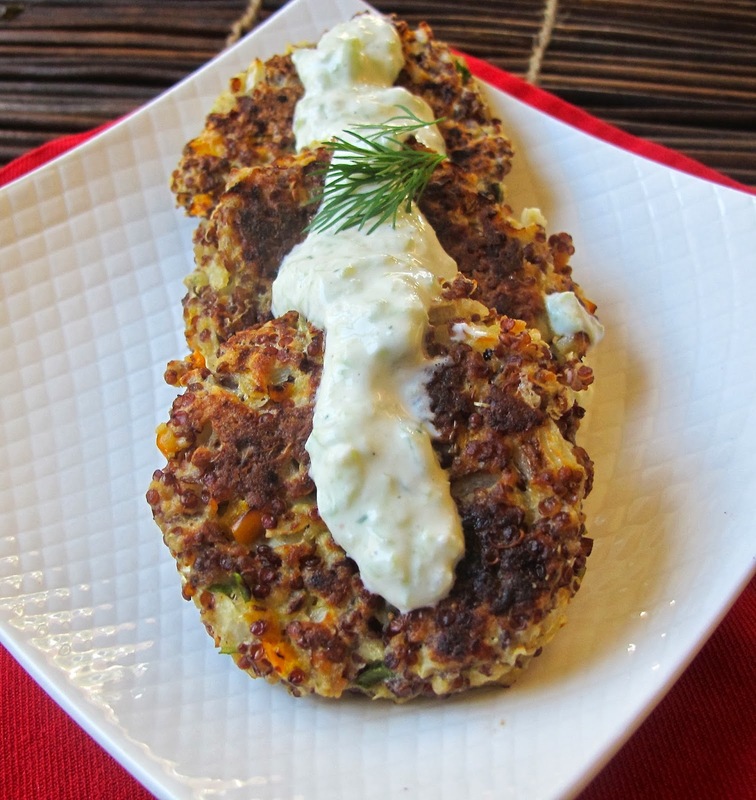 Serve topped with Tzatziki sauce. Let the yogurt and sour cream sit in a cheesecloth lined colander for about an hour to strain. In a small bowl, combine yogurt, sour cream, cucumber, olive oil, dill, garlic, lemon juice, salt and pepper, stir well and rest in fridge until ready to use. Note: Rinse 1 cup of quinoa well and cook in 2 cups of vegetable stock or water. Simmer about 15 minutes, you will have quinoa left over. 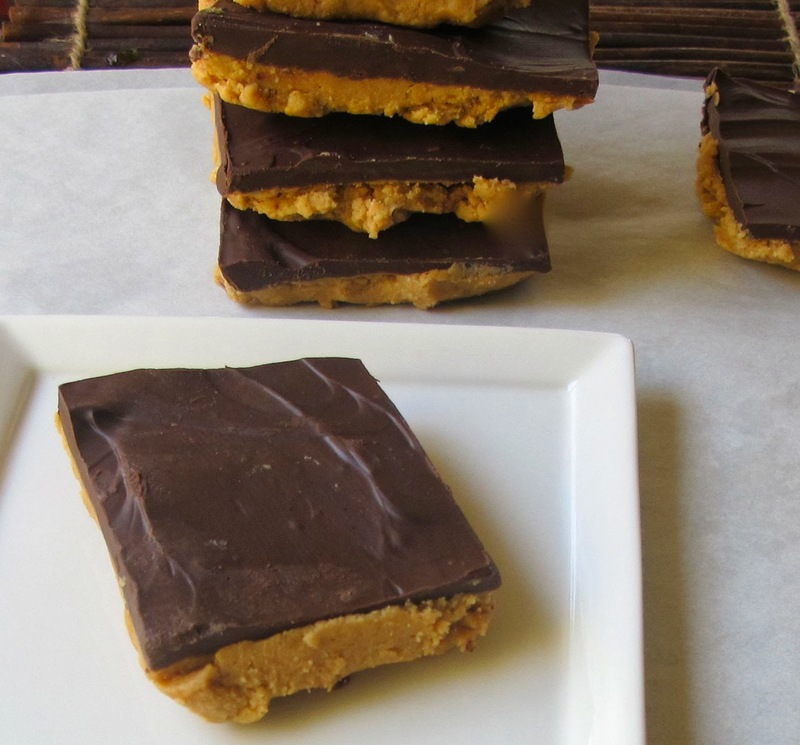 These bars reminded me of peanut butter cups, only easier to make. I did not have a 9 inch square pan so they will be thicker if using one. Any leftover squares should be stored in the fridge. Combine graham cracker, sugar, melted butter, and 1 cup of peanut butter in a large bowl, mixing until well blended. Press evenly into the bottom of a 9 inch square pan. Mix 1/4 cup peanut butter and chocolate chips in glass microwave safe measuring cup. Heat in the microwave at 30 second intervals, stirring, until melted and smooth. Spread chocolate over peanut butter layer. Let stand at room temp for 30 minutes before cutting into squares. We had a delightful visit with Laura, Leighton, Jean and Ralph. They arrived with a bottle of 12 year old white balsamic vinegar flavored with coconut. 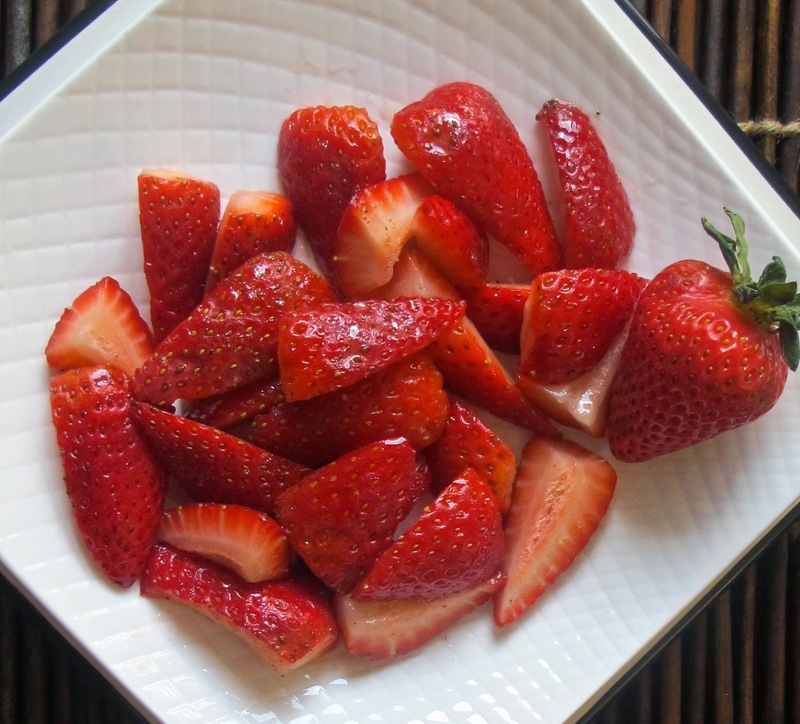 My first thought was to toss it with the strawberries I had sitting on the counter, which we did! But, then thoughts of a quick dinner, that included the white coconut balsamic and shrimp, here it is. In a large bowl, toss the prawns with vinegar and olive oil and let marinate about half hour. Place prawns and marinade on a foil lined baking sheet. Sprinkle with salt and pepper and bake about 10 minutes, turning once until prawns are cooked through. 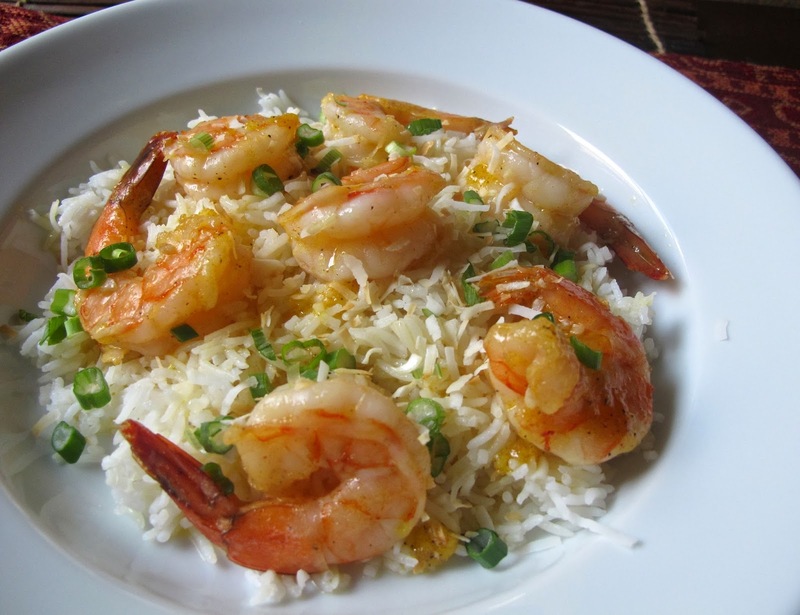 Place cooked rice in a bowl and top with cooked prawns and marinade "sauce." Top with green onions and coconut. Rinse rice well. Add the rice, garlic, and salt to vegetable stock. Bring to a boil, cover and simmer 15-20 minutes or until stock is absorbed.